Space per pupil: 50 sq.ft. 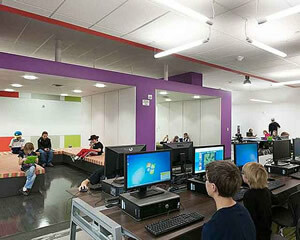 Falcon Virtual Academy is a unique facility that engages unique students through a variety of learning spaces. 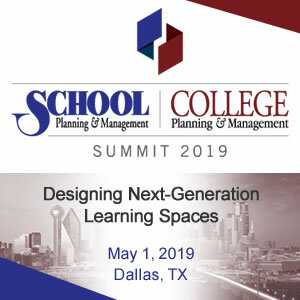 An empty manufacturing warehouse was adaptively reused and transformed into a blended learning environment to serve the needs of K-12 students following an online learning model – primarily home schooled students, working students, and transitional students. These students use the spaces and technology within Falcon Virtual Academy when they need to collaborate on projects or seek instructional support from teachers. 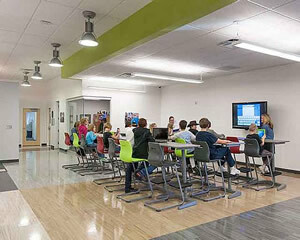 The academy is the centerpiece of Falcon School District 49’s focus on virtual learning. Students get the “Best of Both Worlds” at this school: virtual and hands-on learning opportunities taught by certified teachers in a creative, engaging space. Falcon Virtual Academy’s mission is to engage student’s in an innovative, rigorous digital learning environment that instills critical thinking and comprehensive learning. The aim is to ensure the online learner is academically prepared for the collegiate environment and/or the workforce. This focus on preparing students for college by utilizing on-line courses aligns with that of higher education institutions. It is estimated that one-in-four college students take an online course and attend classes in traditional settings, collaborate with other students in gathering spaces, and meet in off-campus settings. Falcon Virtual Academy, with its modern and mature feel, acclimatizes older students to the experience of a college setting and prepares them for post-secondary education. The result is a learning environment that fulfills the client’s vision for a space where Google meets Facebook. 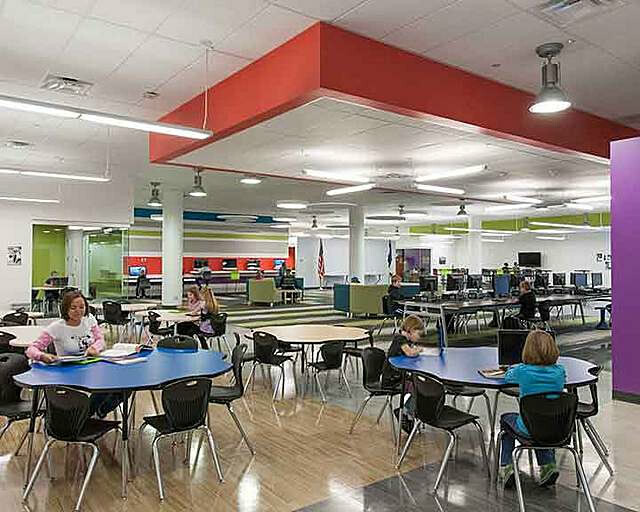 The design team understood the facility needed to be focused on engaging kids and creating spaces to foster innovation and enable delivery of a blended learning program. THE VISION: Falcon School District 49 Assistant Superintendent Kim McClelland had a vision for an educational program she dubbed the Innovation Zone, she just didn’t know how make it a reality. Her Innovation Zone would serve a distinct audience – home schooled students and working students who relied on the district’s online services, and transitional students who flounder in a traditional school setting. In 2010, the Innovation Zone began operating out of existing district facilities. Budget cuts, consolidations, and overcrowding soon demanded a standalone facility be identified to serve the needs of online students throughout the district. Designers and the district conducted a discovery process that generated a vision statement to guide the entire project: Falcon Virtual Academy will be a flexible and innovative educational facility to foster creativity, blended learning, and pride for the students, faculty, and staff that are a part of the school. BLENDED LEARNING: The physical environment of Falcon Virtual Academy achieves this vision by creating a space that encompasses one-on-one spaces, small and large group meeting areas, and both quiet and noisy areas. 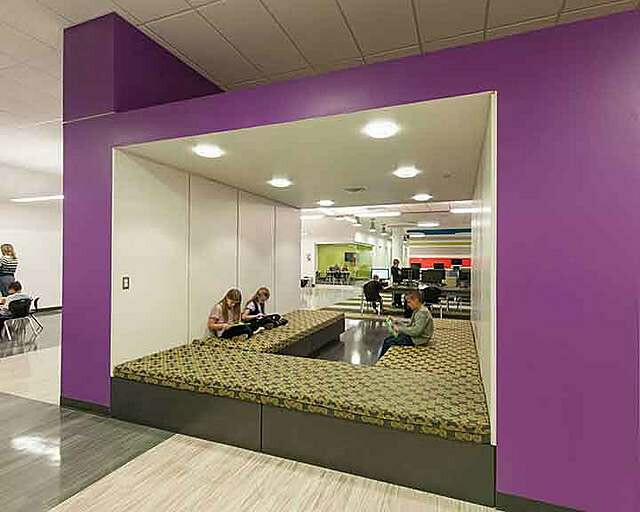 Fun spaces abound throughout the design, like the banquette seating on either end of Quiet Zones I and 2 which allow students to lounge and learn. 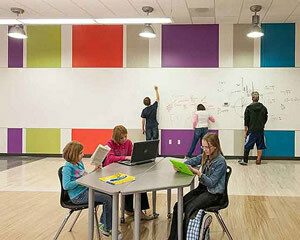 Bright graphics and vibrant colors engage the students visually. Liberal use of marker board paint allows key spaces to be constantly changing while moveable furniture seems to be rearranged daily. Design concepts like huddle areas with AppleTV’s and interactive technology for small group teaming allows students to receive custom instruction while other students work independently using the banquette seating or movable furniture. A “Best of Both Worlds” blended delivery model wouldn’t be complete without the ability to offer hands-on learning opportunities which students cannot experience online. This includes many lab sciences and experimentation-based courses. The science room features epoxy-topped cabinetry and gas hook-ups and fume hoods to allow experiments in courses like chemistry and biology. The blended learning model is based on the concept of students visiting Falcon Virtual Academy for regularly scheduled blocks of time (two-three hours several times per week) to meet with teachers or collaborate on project-based assignments. This “office-hours” model often requires parents or family members to remain on site while students meet with teachers. The design also includes an inviting lounge space for parents and family members to wait while their student is meeting with a teacher. The lounge area features a TV and wi-fi so parents and family members can relax, make calls, access the web, or view the academic instruction taking place. ADAPTIVE REUSE: The adaptive reuse of an aging manufacturing warehouse into a new, state-of-the-art Falcon School District school provided critical infill in a struggling area of the city, extending Falcon School District’s commitment to the community. At $55 per square foot, and a final construction cost of $1.1 million, the reuse also was an effective and responsible use of patron dollars. The district leveraged funds responsibly to obtain a long-term lease, creating a new use for an abandoned building. As Falcon Virtual Academy serves online learners across the district, the central location of the warehouse space was a strategic benefit. Located in central Colorado Springs on Constitution Avenue, immediately adjoining Powers Boulevard and close to Highway 24, the school is easily accessible to all of the District’s students and to the greater community.